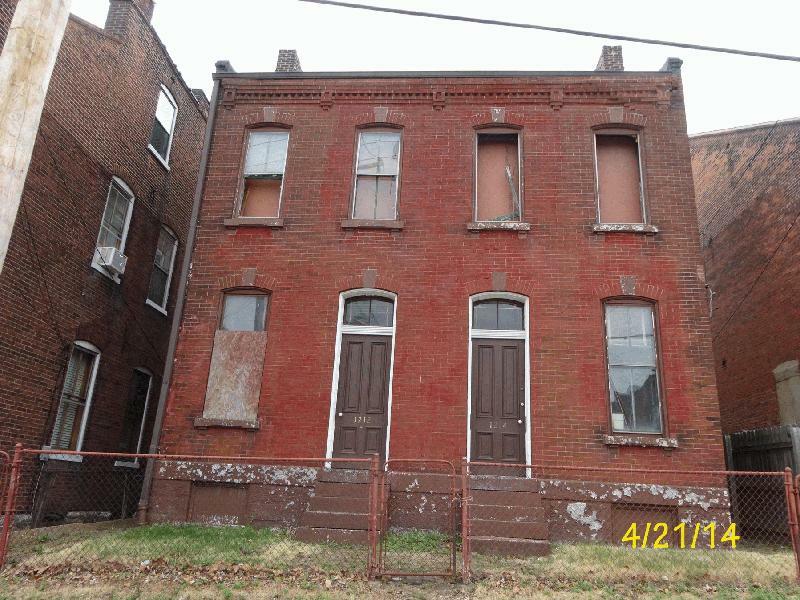 One of Soulard’s last remaining visibly vacant structures will soon be rehabbed. The building at 1212-14 Lynch, listed by the City Assessor as a three-family structure, will see a $200,000 rehab into two fee simple townhouses by owner Renovations Unlimited, LLC. In February 2011, this building was threatened with demolition by a previous owner. The building had caught fire and the owners sought to demolish the building instead of rehabbing or selling. The city’s Cultural Resources Office (CRO) staff recommended denial of the demolition permit for the building. The Preservation Board heeded this recommendation at the February 2011 meeting. The PDF of that meeting’s agenda that details the building’s then-current condition and the CRO recommendation may be found here, on Page 44. Below is a Geo St. Louis photograph of the building.